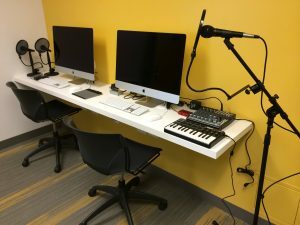 The Digital Foundry is an AV studio and technology lab for teens located at the Main Branch of Boulder Public Library. Funding for the equipment was generously provided by The Boulder Library Foundation. Monday: 1 p.m. – 7 p. m.
Tuesday: 2 p.m. – 6 p.m.
Wednesday, and Thursday: 1 p.m. – 7 p. m.
Friday and Saturday 2 p.m. – 5:30 p.m.
Sunday: 1 p.m. – 6 p.m.
Raster, Vector, 3D, and Animation. Use our lab to create all kinds of digital art. The Foundry has digital cameras, audio recording equipment, portable lighting, and 2 green screens to get you going. Midi Keyboard, Mixers, Microphones and more. We’ve got a recording space for you. Grab one of our DSLR cameras and a lighting kit then get snapping.